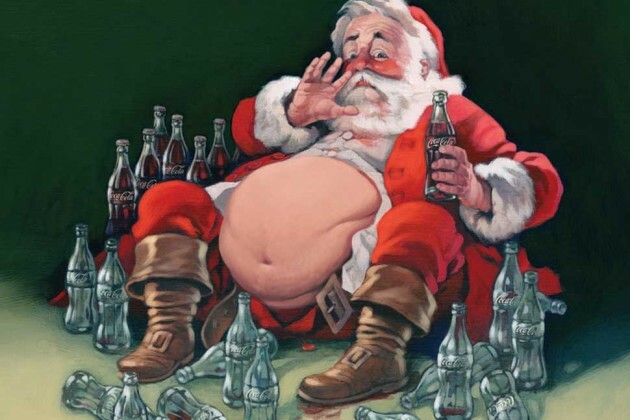 I remember my sophomore year in high school where I decide for a New Year’s Resolution to give up soda (or as I called it then, “pop”) as I thought i was becoming a bit too addicted to caffeine. After a few days of withdrawal, I was fine. I’ve never looked back. Since 1993, I’ve been off the juice. Other than a special Captain and Coke and super-rare RedBull and Vodka, I’m free of caffeine these days. I really enjoy it. It keeps me balanced. I have noticed that i’m more likely to do a run or cardio activity in the morning to get going as it’s really the only way I know to get my brain cruising. I’ve also noticed that in the rare occasion when i do have some caffeine, man does it hit me. I go crazy. I’ve also noticed that if i mix lots of liquor and caffeine, i’m sometimes sleepwalk – leading to some really weird stories. That’s another blog post. While i’m on the topic, a huge pet-peeve of mine is that lack of drinks available that are both diet AND caffeine free. It’s usually either-or. You have Sprite, 7Up and some root beers that are caffeine-free, and then you have Diet Coke, Diet Dr. Pepper and such. You can’t have both for some reason. That really bothers me. I was thinking about this habit of mine when I read a new article in Business Week about the decline of Coke. There’s some fascinating stats in there list below. All in all, I like being off the sauce. During the 1970s, the average person doubled the amount of soda they drank; by the 1980s it had overtaken tap water. In 1998, Americans were downing 56 gallons of the stuff every year—that’s 1.3 oil barrels’ worth of soda for every person in the country. Since 2000, soft-drink sales stabilized for a few years; in 2005 they started dropping, and they haven’t stopped. Americans are now drinking about 450 cans of soda a year, roughly the same amount they did in 1986. For Coke this is a problem. 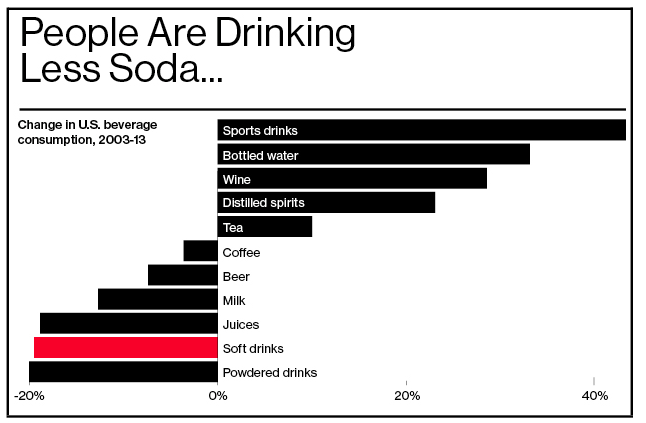 Soda makes up 74% of its business worldwide and about 68% in the U.S. Sales of Coca-Cola’s carbonated sodas fell 2% in the U.S. last year, the ninth straight year of decline. Coca-Cola made $46.8 billion last year, down from $48 billion in 2012. Diet Coke tumbled especially hard, dropping 7 percent, almost entirely the result of the growing unpopularity of aspartame amid persistent rumors that it’s a health risk. Today, Coca-Cola has 130,600 employees and makes 500 different beverages that people around the world drink 2 billion servings of every day. A quarter of all carbonated beverages consumed globally are made by Coke; Pepsi is at 11%. By 1999, according to the CDC, a fifth of all U.S. adults were obese; today that number is 35%. Obesity rates among children have tripled since the 1970s. Coca-Cola now knows that 40 percent of the drinks customers buy have an added flavor and that people over 34 drink mostly caffeine-free Coke in the afternoon.